Inside air quality is a critical issue because increasingly, steps are being taken to tighten the homes envelope; this increases energy efficiency. Unfortunately, this can elevate radon, carbon monoxide, and deadly black mold spores. This raises the question, What can you do to protect the family against these invisible dangers? The answer is simple; test the interior air quality and then take action to correct any conditions that exceed the minimal hazardous levels. Its worth mentioning that many airborne pollutants arent notable although they may be present. If you are lucky enough not to have allergies you might never be alerted to contaminated air. What are Indoor Air Pollutant Sources? Documentation at www.cpsc.gov indicates that these pollutants arise from many sources including moist carpeting and padding, offgassing from construction materials, furniture and cabinets constructed from engineered wood products, and even seemingly innocent air fresheners. Of course toxic pesticides are always a problem. Use citrus-based sprays instead. They are safe and fragrant. Even households that consume organic produce arent safe from other dangers because these may find their way into the house by other avenues. 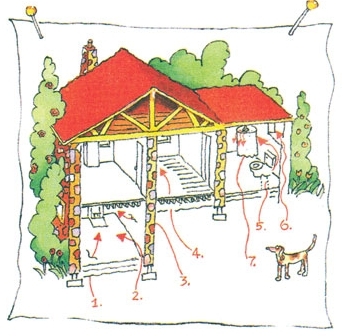 For example, radon gas which is a odorless carcinogen enters the home from outside (see the illustration at the top of this article). Conventional houses that have a focus on green building and energy efficiency are built with a more tightly sealed envelopes than older homes. Although this approach is fine for energy conservation, an effect is to trap pollutants inside. In particular, basement ventilation devices that arent coupled with a filter can allow more harmful elements in. Mechanical ventilation isnt the only mode of entry; by a process called infiltration, harmful contaminants can enter. This happens when exterior air enters the house through cracks in walls, porous mortar joints on brick veneer, ceilings, and floors. How Can You Spot Air Quality Issues? In some cases, contaminants are obvious, resulting in headaches, dizziness, and other physical trauma. An unexpected amount of condensation showing up on walls and windows might be a sign of inadequate ventilation. Stuffy air or a foul odor is also a red flag that you have problems. Biological contaminants are incredibly diverse and include (but are not limited to) cockroaches, pet dander, viruses, pollen, mildew, black mold, and yes, everyones favorite, cat saliva. These pollutants might often manifest as an allergic reaction, an uncharacteristic sneezing fits, humidity fever (exposure to poisons from microorganisms growing in ventilation systems of large buildings, sometimes chilled water air conditioning systems), or watering of the eyes. Maintain a clean home; dust bunnies do not acceptable pets make! Just say no to carpet stains and health issues by cleaning food spills and pet accidents immediately. If your house is equipped with a basement drain, be sure to inspect, clean and disinfect it on a monthly basis. Install and use electric vent fans in your kitchen and baths with a duct connection to the exterior of the residence. The one in your kitchen will keep your air cleaner if you fry food and the one in the bath will remove moisture, minimizing your chances of mold and mildew. Change out your central air conditioner/heater return air filter each and every month. Your HVAC manufacturer may recommend a longer time between changes but it is best to err on the side of caution, especially if you have pets or allergies. When building materials or carpets get wet, dry them right away. Again, you want to minimize your chances of mold and mildew. Radon testing kits are an affordable way to determine if radioactive gas is in your home and if the level is in the acceptable zone or whether its elevated enough to pose a health threat. In the US, you can also take advantage the EPAs voluntary National Radon Proficiency Program (RPP) which uses evaluated testing contractors. It is important to perform carbon monoxide testing. Second hand smoke is a politically correctness and social issue, but that aside, its a scientific fact that tobacco smoke is indeed a complicated health risk to everybody in the home and has especially harmful effects on children and pregnant women. The resolution to the second hand smoke problem is clear as a bell; do your puffing outside or in a specific room that has an exhaust fan to the outside of the house. You will also be saving yourself a cleaning chore; that nasty sticky film that settles on surfaces is also a dust magnet.